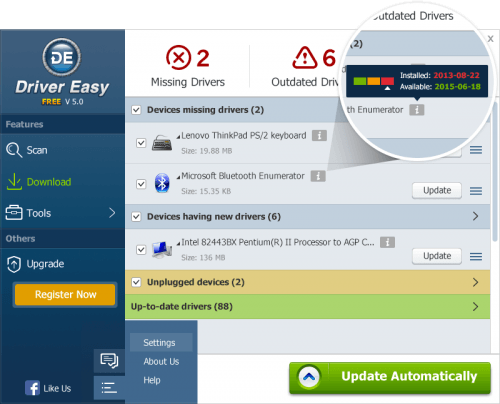 Driver Easy Version 4.9.7 was released recently. 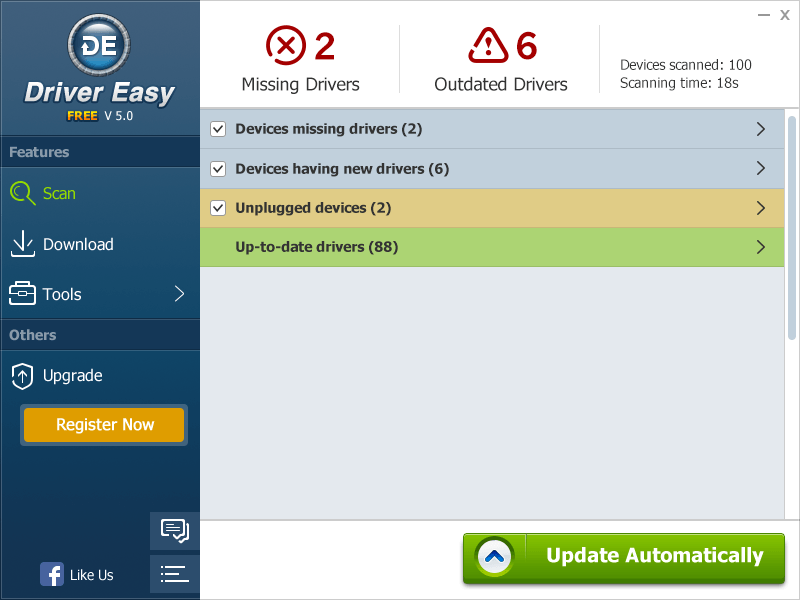 We have added the Feedback feature into Driver Easy V4.9.7, which is supposed to be the new feature in Driver Easy Version 5.0. So you can test this feature before Version 5.0 is released. Your any idea and suggestion would be greatly appreciated. In this article, we would continue to post the new things in Driver Easy Version 5.0, by comparing with Version 4.9.5. With each version, you can simply start Scan from the main screen. The Scan tab in Driver Easy Version 5.0 will display more information like Driver Status, the number of problem drivers, etc. The most useful information is the Driver Status. 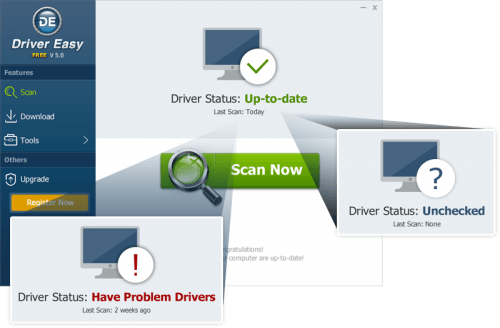 After you do a scan, whenever you open Driver Easy again, you will get the status of drivers immediately. If all drivers are up-to-date, Driver Status will tell that they are up-to-date. If there are outdate drivers or missing drivers, Driver Status will tell that you have problem drivers in your computer. This allows you to fix the problem drivers in time. Scan tab in Version 4.9.5 won’t tell you the driver status directly. In the Download tab of Version 5.0, at the first glance, you can tell exactly which device is missing driver or has new driver, as they are listed under different categories. For instance, the device with missing driver will be listed under category Devices missing drivers. You can also get the total number of missing drivers and outdated drivers. The Download tab in Version 4.9.5 doesn’t have different categories. All devices are listed together. The devices in different category are displayed in different color. For instance, the device in red is missing driver. Since this is confused for many of you, we decided to make a big change in Driver Easy Version 5.0. 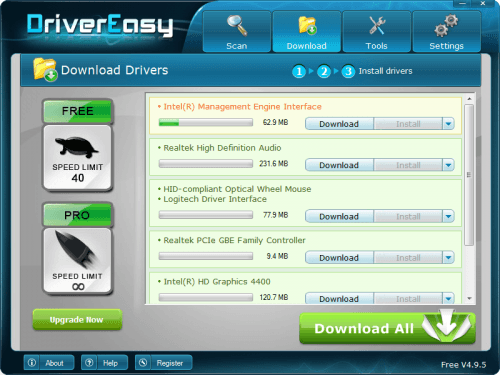 Besides, the new design of download tab allows you to get the installed version and the new version of the driver easily. Just point the mouse cursor to the icon with “i” on it. The program will display the information automatically like following screen shot shows. 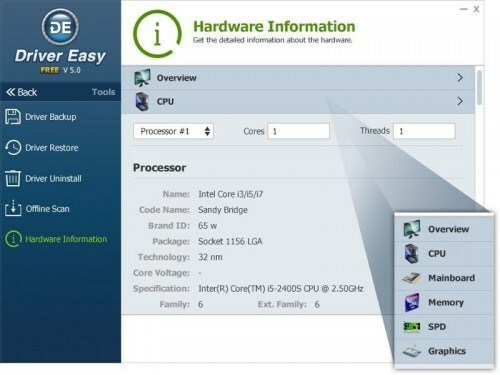 Version 4.9.5 and Version 5.0 display the information of the basic hardware in your computer. Version 4.9.5 only shows you the basic information of the hardware. But Version 5.0 will show you more specific and more detailed information. For instance, in Version 5.0, you can get the detailed information such as Name, Brand ID, Core Voltage of CPU. Please leave your mments if you have any ideas or suggestions.